At the heart of Union Atlantic lies a test of wills between a young banker, Doug Fanning, and a retired schoolteacher, Charlotte Graves, whose two dogs have begun to speak to her. When Doug builds an ostentatious mansion on land that Charlotte’s grandfather donated to the town of Finden, Massachusetts, she determines to oust him in court. As a senior manager of Union Atlantic bank, a major financial conglomerate, Doug is embroiled in the company’s struggle to remain afloat. It is Charlotte’s brother, Henry Graves, the president of the New York Federal Reserve, who must keep a watchful eye on Union Atlantic and the entire financial system. Drawn into Doug and Charlotte’s intensifying conflict is Nate Fuller, a troubled high-school senior who unwittingly stirs powerful emotions in each of them. Alan Cheuse reviewed the novel on All Things Considered. Listen here. On On Point Tom Ashbrook discussed the novel in a live broadcast with listener call-ins. Listen here. Esquire selected Adam for its 2009 Best & Brightest issue. Their piece on the book is here. Their excerpt of the novel (the prologue) can be read here. The first great novel of the new century that takes the new century as its subject…It’s big and ambitious, like novels used to be. It’s about us, now. All of us. 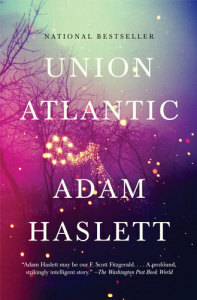 It’s remarkable how successfully Union Atlantic — so unlike [his] stories in structure and style, and so much broader in scope — continues the nuance of Haslett’s earlier characterizations. Adam Haslett may be our F. Scott Fitzgerald…A profound, strikingly intelligent story. Exceedingly well written…a high-spirited, slyly astute exploration of our great bottoming out. Adam Haslett’s page-turner of a debut novel ranges brilliantly from the Strait of Hormuz to the outskirts of Boston to the belly of the financial beast—New York’s Federal Reserve. It explains to me, with humor and style and generosity, how we became America in the year 2009. A must read. Adam Haslett has the rarest of talents: the ability to combine a powerful intelligence with storytelling that is both elegant and suspenseful, and to break your heart in the process. Union Atlantic is a masterful portrait of our age.